Yet Another Mod Launcher (or YAML for short) was created for educational purposes only. Thanks again for all the work you did with that important tool. 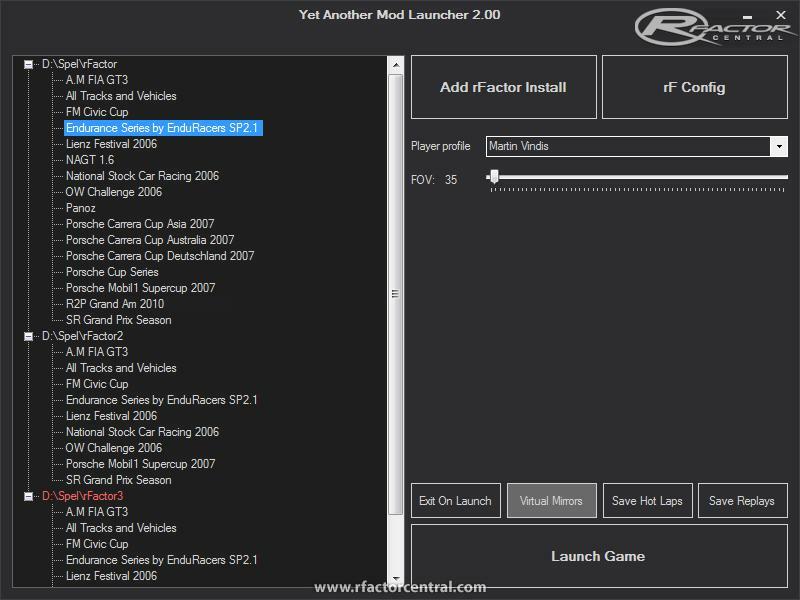 I'v made 3 installs of rfactor but I can't seem to replicate the issue your getting. I have a theory but before I make another release I just want to make sure. Could you please answer the questions below to help me, would be greatly appreciated. 1) What mods are you trying to run when this occurs? 2) What mods did you run before? My theory is that either that the previously ran mod have some unusual characters in the file name (I'm not too savy with regular expressions, just started learning it in this project but I'm getting there ), therefore the launcher can't find the correct string in the PLR file, or the launcher launches rfactor before it has saved and closed the PLR file with the new information. Thank you for the new version! I´ve tested it with three installs unfortunately it doesn´t work quite well. If I switch through the installs and try to start different mods v1.1 just starts the last used mod (like rF would do it). Sometimes it did work mostly it did not. Can you please have a look at that? And if it´s possible can the list show every mod of every install? Thanks for the info rainmaker. The new version is up and ready for testing, it has support for multiple installs so feel free to try it out. Thanks for the input guys, greatly appreciated. I will look in to this but I have to ask, what's the benefit of having more then one installation? It would be interesting if the program could serve different installation paths. I doubt that there are so much rF users out there that only have one install. To launch from all installs in one prog would be a killer!